The S300 is the most powerful, versatile and user-friendly audio console in its class. It offers a compelling combination of extremely powerful features, hugely versatile installation options and outstanding value. S300 is a compact control surface that can be combined with the complete portfolio of SSL’s System T control, processing and I/O options. It can be specified as part of a larger System T installation or in stand-alone configurations for smaller broadcast facilities or OB vehicles. 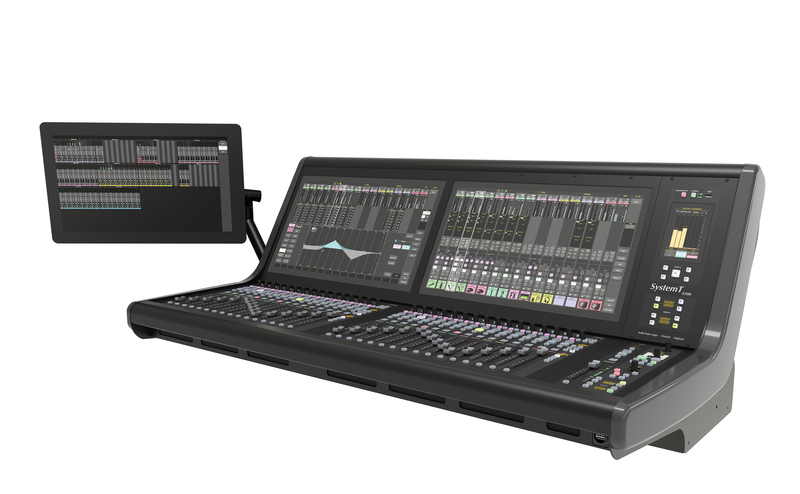 S300 presents the extraordinary power and versatility of SSL’s System T audio production environment in a streamlined console layout that remains intuitive for operators with a wide range of skill levels. A smaller scale S300 based System T installation offers the simplicity of a console + processor + I/O configuration with the benefit of compatibility with the family of additional fully networked System T control interfaces as required. Within larger facilities S300 is a superb additional or backup console. Complete showfile compatibility between control interfaces means production can easily move between consoles and control rooms within a facility. Where processing engines are of different sizes SSL’s unique compatibility mode allows the pre selection of channel, busses and effects resources that will be inactive on the smaller processing engine. Settings from the larger device are never lost and resources can be reassigned at any point during the show, even with audio passing.